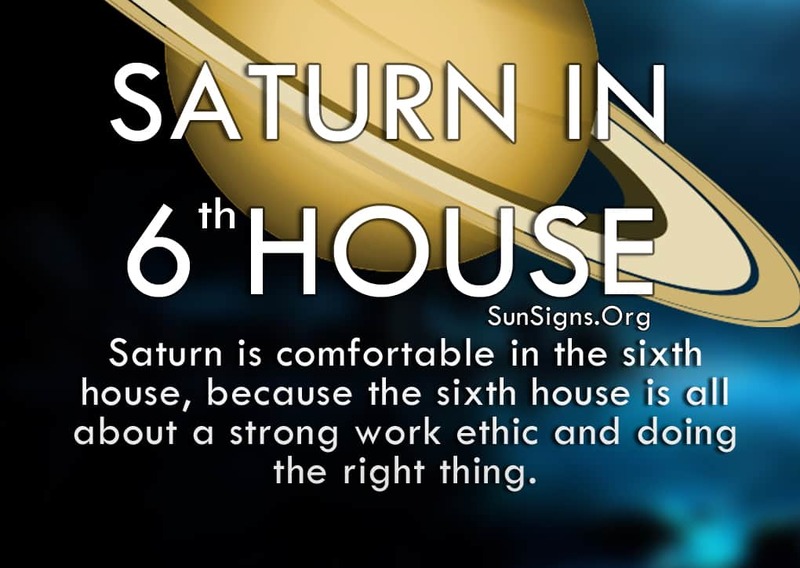 Saturn is comfortable in the sixth house, because the sixth house is all about a strong work ethic and doing the right thing. Practical and reliable, you are one of the most dependable people among your social network and they know it. Just make sure you don’t work too hard. Saturn represents an authority figure in our lives, one who emphasizes our Karma, commitment, caution, maturity and responsibility. This is the main focus for the sixth house, as you thrive on hard work and dedication. You feel having a stable career offers you a stable lifestyle, so that’s what you are always working toward. And even after you have achieved that you are always afraid of losing it, so you work to ensure its continued existence. But while this is a noble undertaking, it is sometimes unnecessary and can cause undue stress. (Get tips to overcome stress). The Saturn in 6th house meaning shows that you stay busy to feel useful, and are willing to go above and beyond what’s expected of you to make sure everything is executed perfectly. You are extremely detail-oriented and you take pride in that fact. You want everyone to see just how much work and experience you put into something, and expect high praise in return. This is where Saturn reprimands you a bit, making you feel vain or silly for wanting that kind of recognition. But you deserve it after all the effort you put into whatever you’re doing. (Read more about Saturn symbolism). The Saturn in sixth house astrology predicts that you put a lot of pressure on yourself to be perfect in every way, and that’s too much for anyone to handle in a healthy manner. All that worry can affect your well-being in a negative way, so be careful not to get too upset over imperfections. Those around you appreciate all of your efforts. Another thing to watch out for is taking things too seriously. You have to learn to lighten up a bit and enjoy what’s happening around you. You can get so wrapped up in making sure everything is just right that you miss the event you put together. Loosen up a bit and learn to live in the moment. Not everything has to be perfect. This comes naturally to you as Virgo is your ruling zodiac sign. In fact, some of the best times in your life won’t be. They will be messy and spontaneous and they will teach you that you can’t plan everything. And stop worrying about the things you can’t control. Life will always have some chaos in it, so you have to be able to go with the flow. While Saturn in 6th house‘s instincts tell you to be careful, which is usually good advice, it can also keep you from taking risks. Sometimes you have to just go for it and not care about the consequences, for that can lead you to some pretty great rewards. Being responsible will serve you well, but don’t forget to mix it up. That will serve you even better.